With shows like Sword Art Online, Log Horizon, and No Game, No Life, recent years have certainly seen a fair few anime set around the idea of humans becoming trapped within a video game for one reason or another. 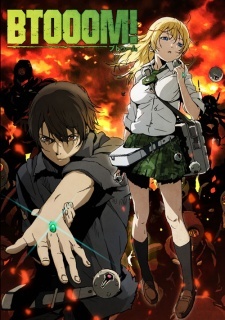 Recently I decided to take a look at one of the smaller hits of last year, BTOOOM!, which plays with a similar idea to those mentioned above, but shakes things up enough to keep them interesting. Read on to see what I thought! This entry was posted in Anime, Anime Reviews, Reviews and tagged Anime, BTOOOM!, Log Horizon, Madhouse, No Game No Life, Review, Sword Art Online on 5th April 2014 by Demelza Ward.